As part of my summer commission for the Colorado College Music Festival, I was asked to develop a playlist of pieces of music inspired by architecture, to be played in the exhibition space where a concurrent exhibition on architecture was being shown. For the occasion I revisited some old pieces, and found some new ones to admire, which I list below. Vespro della Beata Vergine, Claudio Monteverdi 1610. Monteverdi’s Grand Vespers was written for work—he wanted the job as cappelmeister at the St. Mark’s Basilica, the same building for which Stravinsky would write a tribute some 350 years later. Monteverdi’s mission was successful— three years after the writing of this piece, he landed the job. Included in the piece are such trademarks of writing for a large cathedral as antiphony between two separated choirs. Grande Messe des Morts, Hector Berlioz 1837. Berlioz’ Requiem, composed for a combined orchestra and chorus of between 400-800 musicians, was one of his large-scale “architectural” works, in which he sought to match the forces to the space in which the piece was to be performed. The monstrous Requiem received its premiere at the equivalently enormous Les Invalides in Paris, and makes copious use of the space, including having parts of the orchestra positioned in the North, South, East, and West points in the cathedral. Music for Strings, Percussion, and Celeste, Bela Bartok 1936. Bartok’s large-scale work, itself architecturally conceived, is an instance of music that inspired architecture. In 1992 architect Steven Holl built a house based on the piece for a client in Dallas, Texas. Called Stretto House, the house transposes the effects of the score—with its contrast of light and dense materials, its use of contrapuntal devices such as stretto—into architectural terms, contrasting wavy and straight walls, and having elements echo throughout the house in stretto-like fashion. Correspondences, for String Orchestra and Tape, Milton Babbitt 1967. Milton Babbitt’s music is part of a mid-century movement, called total serialism, that attempted to structure every part of a musical composition according to abstract, mathematical means. In a sense, then, there was a pre-existing blueprint for the piece, which was then put into score form and realized by the musicians. As different as this music may sound from what I write, I am a tremendous admirer of Milton Babbitt and his music remains for me among the most compelling written in the twentieth century. Rothko Chapel, Morton Feldman 1971. I’m no Brad Pitt, but I have long been inspired by contemporary architecture and its practitioners. Over the past decades, I’ve looked on as some of the most brilliant, daring, and innovative ideas about form, space, composition, and design have come from an international cadre of visionary builders, and architecture has thereby grown to become one of the most important and influential art forms of our time. 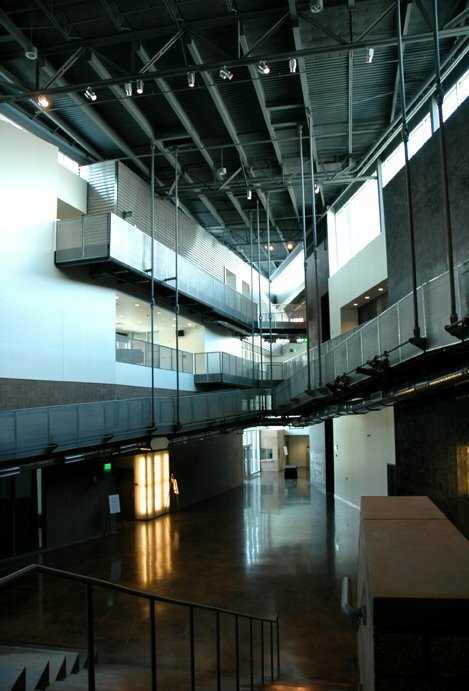 My relationship with architecture deepened when I wrote an orchestral work of music inspired by contemporary buildings in the Summer of 2009 for the Colorado College Summer Music Festival’s 25th Anniversary season. As a corollary, I thought I would put some of the architecture I was inspired by on my site, along with other music inspired by architecture. I chose a series of buildings that had had a strong personal impact to serve as inspirations for the movements of the piece. I decided to try and be quite literal in projecting the features of each building into the musical realm. The ultimate goal was to convey the feeling of each building in music, but by being very literal-minded I thought I stood the best chance to get away from my compositional habits, to push myself to do something different and new. Below are glosses on each building, they are pretty! Tadao Ando, Pulitzer Foundation—I first became aware of Ando’s work through the beautiful Taschen monograph of his buildings. I was amazed by the great simplicity of his designs, which were however strong, unique and new. I wondered whether Ando’s work, with its the preponderance of concrete, would feel cold in person. But when I visited the Pulitzer Foundation in St. Louis I was startled to find the large concrete walls to be in fact quite soft and warm, thanks to a very particular and precise pouring technique Ando has developed (the walls had to be re-poured four times before they met with Ando’s approval). In their finished state, you could practically use them for pillows. 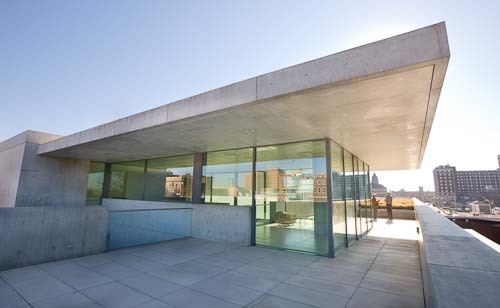 The Pulitzer Foundation is an oasis of beauty in a rather forbidding environment. The building offers a kind of introspective, aesthetic shelter amid the industrial aridity of its surroundings; its long hallways and courtyard surrounded by protective concrete offer a quiet repose, away from the noise and bustle of the city further off. Due to the positioning of the high windows in the building’s main, long hall, there is a fascinating play of light, which flickers off the water from the adjacent pool, slowly changing and evolving over the course of the day. Ando’s work always seeks balance between the manmade and the natural—here the concrete walls are offset by the serene pool, as well as judicious placements of gingko trees and natural grasses in the outdoor areas. 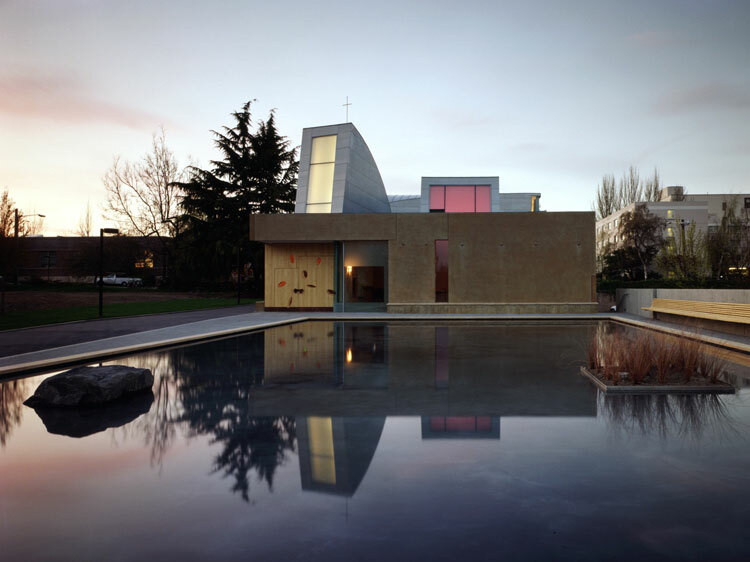 Steven Holl, St. Ignatius Chapel—I will never forget approaching and entering Holl’s chapel. The building is situated on the Seattle University campus, but the rear approach is again through a rather bleak, industrial area of the city. Approaching the building’s beautiful, heavy Alaskan Cedar doors in this context was quite a shock; going inside I had a magical feeling that I had entered a completely different world. The soft light and shifting angles of the interior combine to form a uniquely contemporary sanctum of spirituality. The building is based on the idea of “Seven Bottles of Light,” derived from St. Ignatius’ idea of bathing spiritual, philosophical, and practical questions in different lights, looking at them from all possible perspectives, in order to make authentic and just decisions. Holl translated that idea into his concept of bottles of light within a box, each having a different shape and stained-glass windows of different colors. Antoine Predock, Cornerstone Arts Center—The Cornerstone Center is a part of a fascinating conversation on how space can inspire creativity and interaction, instigate social interchange and lead to unanticipated collaboration. Indeed, the vast open space at the heart of Predock’s design, with high visibility into spaces of learning and creative activity, seems to invite interaction. What struck me the most when in the Cornerstone Center were the unpredictable lines formed by the catwalks. Just seeing them encouraged me to think about form in different ways. When I visited the building I took a general tour and then just started walking obsessively around and around the catwalks. As I was walking a kind of spiraling theme came to me, and I continued walking as I developed it in my head. Conveniently, there was an unused piano in the studio on the ground floor of the building and I used it to work out that and the rest of the ideas in the piece, right in the very space that inspired it. Santiago Calatrava, Milwaukee Art Museum—I first experienced Calatrava’s work at an exhibition at the Metropolitan Museum. I was fascinated by his innovative uses of form, and his interest in straight lines placed at angles that come together to give the impression of curves, and in motion that animated simple forms in geometrically unusual ways. Calatrava had attained a signature style that was very simple and yet very strong and striking. 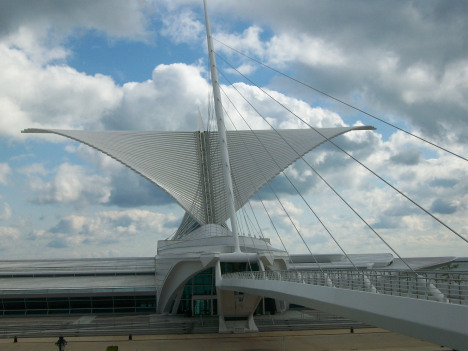 The Milwaukee Art Museum is Calatrava’s most significant design in the US, which made it a natural choice for this piece. But I was unprepared for the experience of actually seeing this building, with its moving wings, in its actual urban context. Even upon arrival in the Milwaukee Airport you are greeted with images of the Museum, right on the large “Welcome to Milwaukee” signs. The building has become an icon, an emblem for municipal resurgence, a source of pride to all the city’s denizens. Located at the end of the city’s most visible thoroughfare, it has the effect of a civic exclamation point. The approach to the building on foot is over one of Calatrava’s trademark suspension bridges, as the main structure rises dramatically above. The great interior hall is a vast open space all in white polished marble and glass, suggestive of a contemporary cathedral. The details are spare and intensely geometric: oblong triangular structural supports recede in the distance down two parallel side halls that connect the great hall with the old wings of the museum. There is no way to walk into that building and not be uplifted and inspired. This impressive structure, full of idealistic feeling inside and out, employs the best in line, color, and makes wonderful use of the light coming off Wisconsin Bay. But what struck me most is how these elements, along with the graceful, elegant motion of the wings as they move, come together to form something much greater: a symbol of aspiration and hope for an entire city. More on Architecture– and the music it has inspired– to come! Hello, and welcome to my new website. We’ve made several changes to the look as well as adding quite a bit of new content for this new release, so feel free to have a look around. I guess the main new addition is this space which I will devote to whatever I’ve been thinking about, or whatever I’ve found inspiring, of late. I’ve done a lot of writing over the years, and this is a great chance for me to put everything together in one place. Once I began my life as a novelist, my wife and I decided we’d go to bed soon after it got dark and wake up with the sun. To our minds this was a more natural respectable way to live. People are offended when you repeatedly turn down their invitations. But, at that point, I felt that the indispensable relationship I should build in my life was not with a specific person but with an unspecified number of readers. My readers would welcome whatever lifestyle I chose, as long as I made sure that each new work was an improvement over the last. And shouldn’t that be my duty—and my top priority—as a novelist? … In other words, you can’t please everybody. No matter how much long-distance running might suit me, of course there are days when I feel lethargic and don’t want to do it. On days like that, I try to come up with all kinds of plausible excuses not to run… now, whenever I feel like I don’t want to run, I always ask myself the same thing: You’re able to make your living as a novelist, working at home, setting your own hours. You don’t have to commute on a packed train or sit through boring meetings. Don’t you realize how fortunate you are? Compared with that running an hour around the neighborhood is nothing, right? Then I lace up my running shoes and set off without hesitating.